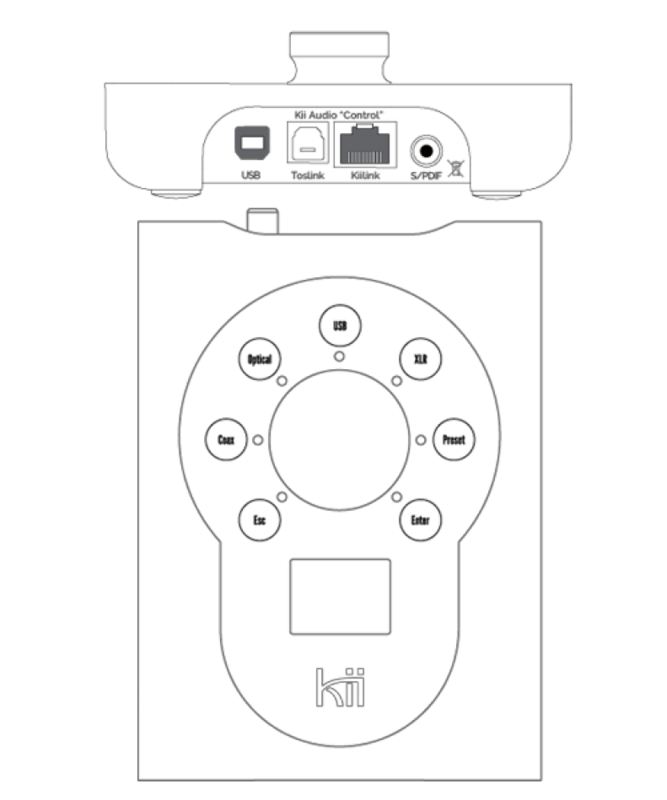 The Kii CONTROL turns the Kii THREE into a complete playback system of highest sonic quality and usability. It offers a user interface for your speakers and works like a digital preamplifier. Only connect your analog source, CD player/drive, server, streamer, TV set or set top box to enjoy a breathtakingly audiophile full range system in a stunningly small footprint. The Kii CONTROL offers three additional digital inputs for the Kii THREE: Coax SPDIF, Optical TOSLINK and USB (up to PCM 24/384kHz and DSD64/DSD128 on USB). All inputs are located on the backside connector panel and can be activated with the touch buttons located around the volume knob. A dedicated input button (labeled XLR) will switch to the existing hardware input on the speaker itself, which you can continue to use as analog or digital input. The Kii Control connects with a single included CAT6 cable and is also powered through this connection. No additional power supply is necessary.Most importantly the Kii CONTROL enables lossless volume control inside the DSP of the Kii THREEs, keeping the signal path of the system as transparent as possible. The big volume knob also offers mute or dim functions and manual power on/off (standby). A dedicated touch button provides direct access to up to six user definable presets. The menu navigation and OLED display vastly expand the options of the Boundary and Contour settings, while also providing access to more advanced system settings, including amongst others for example manual power on/standby, LED brightness, DIM function and limiter indication. The main functions like volume, source and mute can be remote controlled via your IR Remote (RC5 type or Apple Remote). Ultra compact controller/preamp/USB Interface for Kii THREE Loudspeaker.